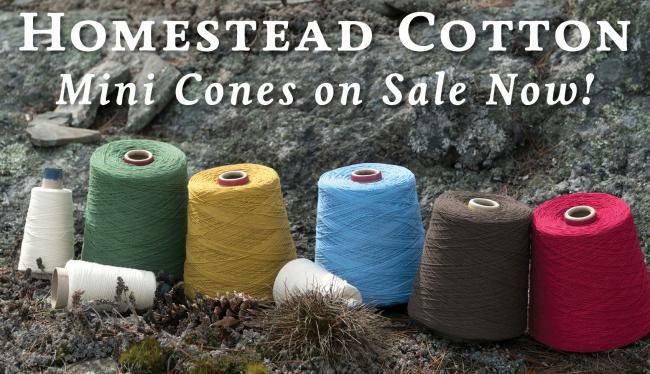 Homestead 8/2 Cotton Yarn is one of our most versatile weaving yarns. A customer and staff favorite, this soft, unmercerized 100% cotton has a great color range, an earthy texture, an affordable price, and it’s machine washable. You’ll find it well suited to items for the kitchen and dining room, as well as fabric for clothing or upholstery. Read on to learn more! Enjoy a multitude of uses for affordable and easy to work with Homestead 8/2 Cotton Yarn. Use for both warp and weft in dish towels and table linens, or in combination with a cotton/linen blend such as 8/2 Cottolin Organic Yarn or a linen yarn such as Newport 16/2 Linen Yarn. When using cotton with other yarns of different fiber contents be aware of dissimilar shrinkage characteristics. Try alternating different fiber threads or use one as warp and one as weft. It’s an excellent choice as warp and tabby weft for overshot coverlets. For the pattern weft consider JaggerSpun Maine Line 2/8 Yarn or Harrisville Shetland Yarn - Unwashed Cones. 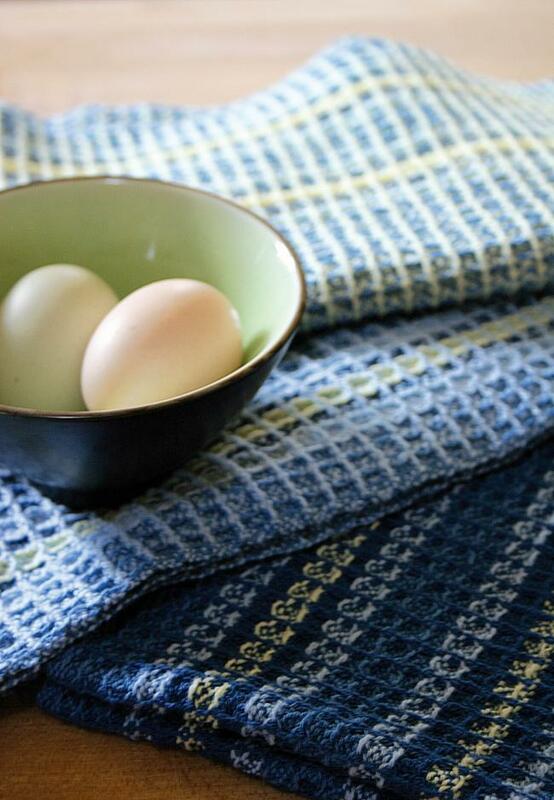 Try Homestead Cotton in lots of great weaving projects. Whatever you make, sample first for best results! 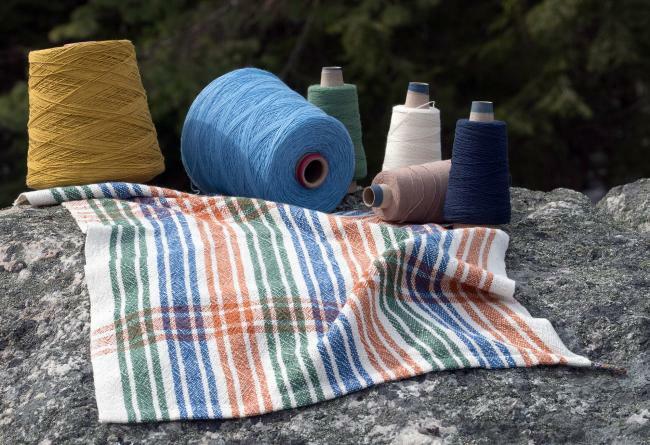 Waffle Weave Towels or Camp & Cottage Towels – available as kits! 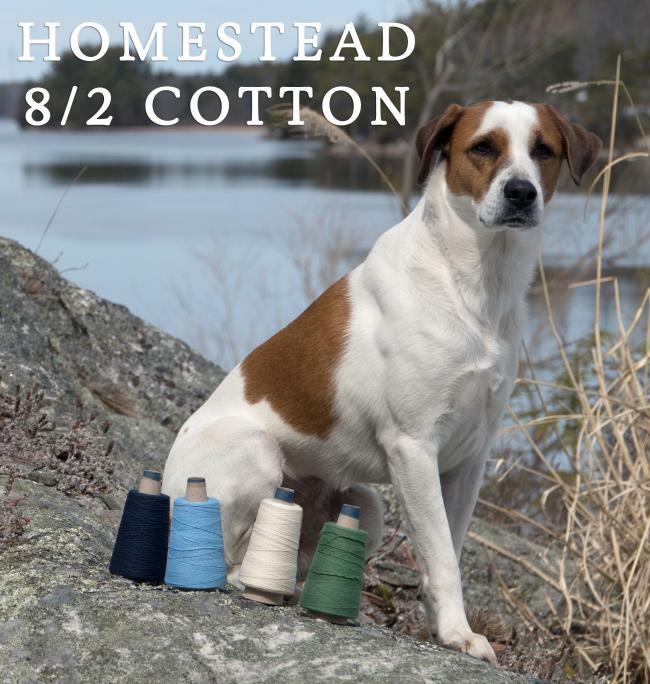 These Handwoven Collection Ebook Reprints also feature great projects in Homestead 8/2 Cotton. Homestead Cotton is too fine for most knit and crochet applications, although it is great for fine gauge machine knitting. It can create some interesting effects if you consider doubling or even tripling it for use in sport and worsted weight patterns. Using multiple strands lets you play with color. Start with six shades that work well together. Knit with three or four strands at a time and periodically drop one or two and pick up others to create gradients. You’ll be amazed how the colors blend and change! Our friend Yogi (looking quite regal) joined us to show off just how lovely these rustic and reliable cottons can be! Homestead Cotton can be machine washed warm/hot and machine dried. Be careful of highly contrasting colors and sample first. If your sample suggests bleeding, skein the yarn and pre-wash it until the water runs clear. To limit bleeding in a finished piece, do not allow it to remain damp for long periods of air drying. Faster drying by machine is preferable, note the shrinkage in your sample as you plan a final piece. Please allow for up to 15% shrinkage when calculating the yardage you’ll need for a particular project. * Large cones are approximately one pound. Each cone may vary +/- 10% and each is weighed and sold at the pound price according to the actual weight. Convenient and economical mini cones are 600 yards each.